« National Postdoc Appreciation Week! Postdoctoral Researcher Antonio Picón (XSD), from the Atomic, Molecular and Optical (AMO) Physics group led by Stephen. H. Southworth, recently published his research in Physical Review Letters. Figure: Twisted attosecond x-ray pulse train obtained through high-order harmonic generation. The paper “Attosecond Extreme Ultraviolet Vortices from High-Order Harmonic Generation” published in Phys. Rev. Lett. 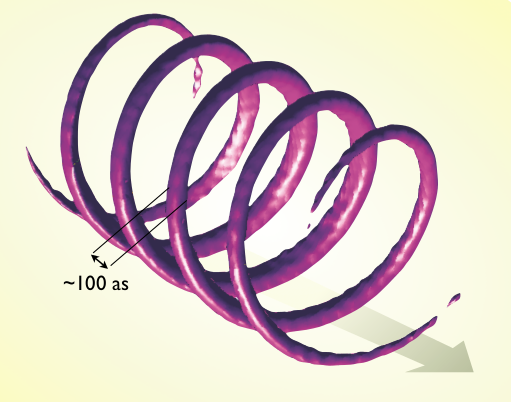 111, details the theoretical study of high-order harmonic generation (HHG) driven by an infrared field carrying orbital angular momentum (OAM). The usual method to generate X-ray vortices carrying OAM is by diffractive masks, as the ones used by Dr. Ian McNulty and collaborators (CNM) to conduct cutting-edge research on X-ray vortices and holographic imaging of magnetic materials. In his paper Picón shows that X-ray vortices can be created through HHG. The combination of OAM with the spatio-temporal characteristics of HHG leads to the prediction of twisted attosecond pulse trains, a helical pulse structure that is stable under propagation. HHG is an extreme nonlinear process in which an electron is removed from an atom by an IR laser to be subsequently driven back to the parent ion, during the same laser field oscillation. Upon recollision the electron recombines with the parent ion emitting ultrashort x-ray flashes, at the attosecond timescale (10-18 s). Antonio Picón Alvarez (XSD) is a Postdoctoral Researcher at Argonne in the AMO group since January 2012. He graduated in the Universitat Autònoma of Barcelona in the Quantum Information group led by Dr. Anna Sanpera. He moved to Dr. Andreas Becker’s group at JILA (University of Colorado), a leading center for AMO physics in the US. He enjoys his position at Argonne in which he has a unique opportunity to perform theoretical work in collaboration with the experimentalists in the AMO physics group. In his spare time he loves to do sailing and running and is now preparing for the Madison Marathon. This entry was posted in Postdoc Publications and tagged antonio picon alvarez, attosecond, optical science, physical review letters, vortices, x-ray. Bookmark the permalink.